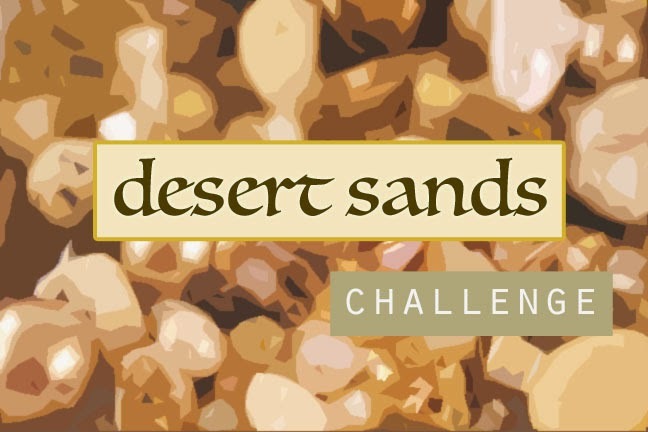 Let me introduce you to the latest Design Kit: the Desert Sands Challenge. With the cold weather upon us (in the northeast), my imagination wandered to warmer climates. In my mind I thought of the alien landscape of the desert – skyward-reaching rock formations, swirling sands, and resilient wildlife. It's a harsh environment, but one of astounding beauty. I thought of these seemingly barren landscapes when compiling the kit. I put together a mix of sandy browns, creamy beiges, and sun-burnt tans. To participate in this challenge, you must purchase a Design Kit. CLICK HERE to visit the online shop to claim your kit and to find out more. I used to post pictures beforehand of the kits, but I feel like there's another surprise element by keeping everything a mystery. You get a general idea of what will be included, but from there... it could be anything. If you're interested in learning more, CLICK HERE. For examples of past challenges, scroll back through my blog. There is a beautiful array of creativity! This charming Christmas Advent Calendar will add to our holiday decor, delight kids of all ages, and be used for years to come. 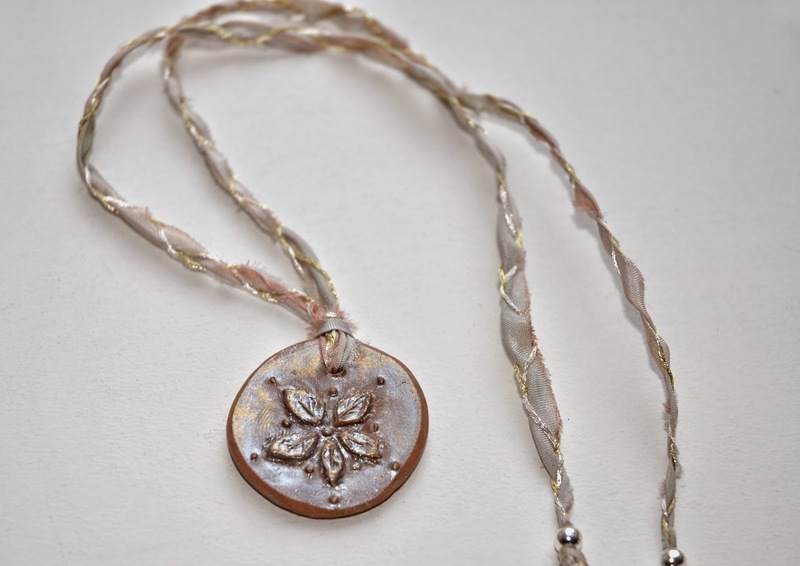 Cyndi shows you how to combine some easy shibori silk petals into lovely flowers. 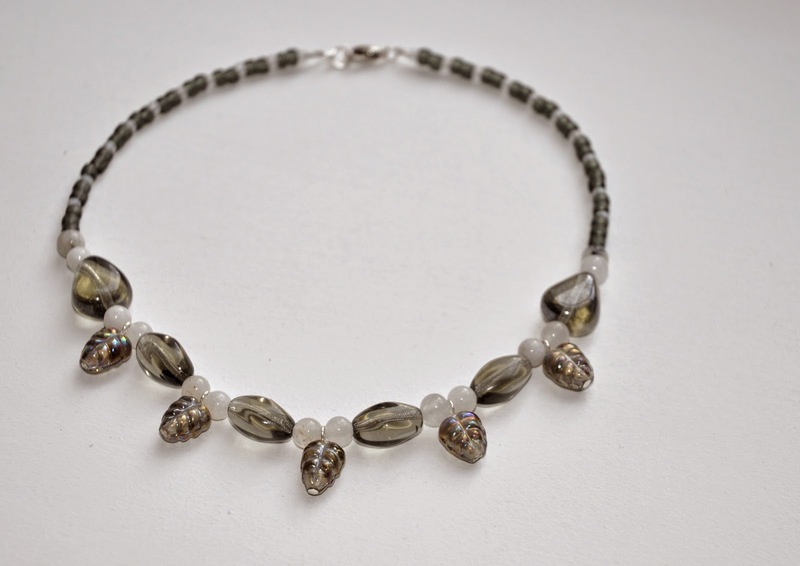 This necklace was made by Laurel Ross! Here's what she had to say about it: "I wanted to play with geometric shapes and used vintage glass beads in this multi-strand necklace." These pieces were made by Naama from Peculiaris. 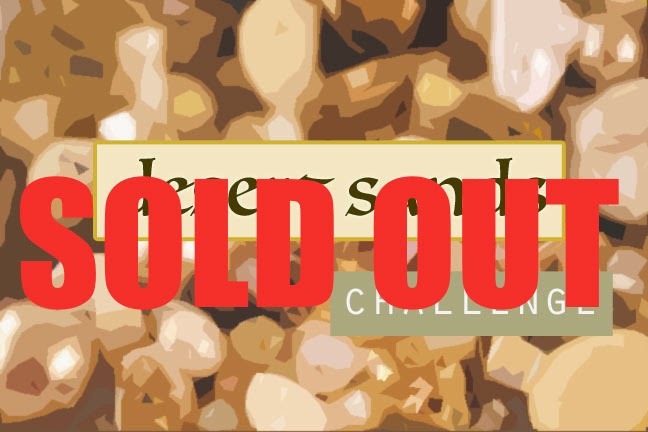 Here's what she had to say about them: "This challenge has been an absolute delight! When I opened the challenge kit I was completely mesmerized by the colors and textures, and for a while I just played around with possibilities. I got so many ideas! In my mind all the pieces are worn together, in a layered moonlit gleam. I'm not sure how realistic it is, but I do love how they all stand apart and combine to something new at the same time. I'll post some more details on the Moon Garden pieces on my Facebook page: http://www.facebook.com/peculiaris If you stop by, please let me know what you think!" Want more? Visit the pages of other Moon Garden Challenge participants and see what they made! This piece was made by Alison Herrington. Here's what she had to say about it: "I had a spool of sterling silver wire that I acquired on a trip to Florida that I wanted to use up. I decided to create a multi-strand necklace of wire-wrapped link chain. 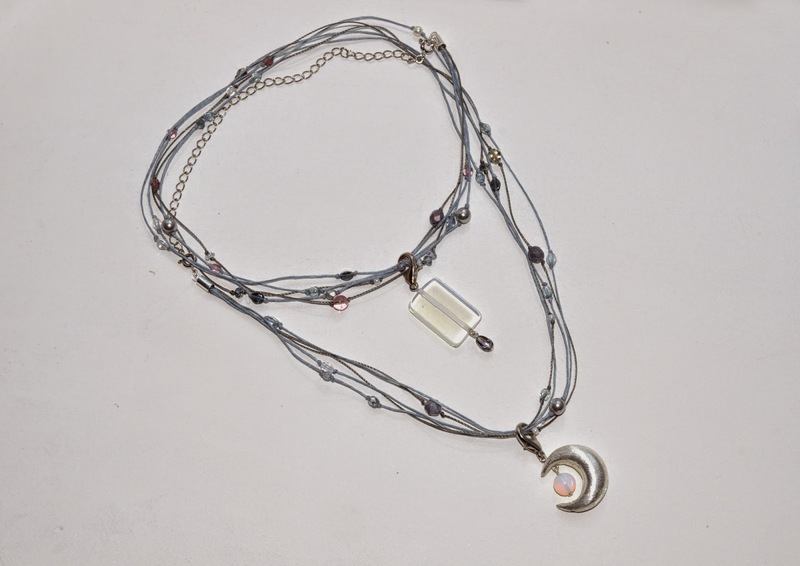 The wire-wrapped links were strung up with the opalescent glass, Japanese milk glass, crystals, and Czech glass. I combined the wire-wrapped links with some chain for texture. The focal is the Mystery Component created by Andrew." 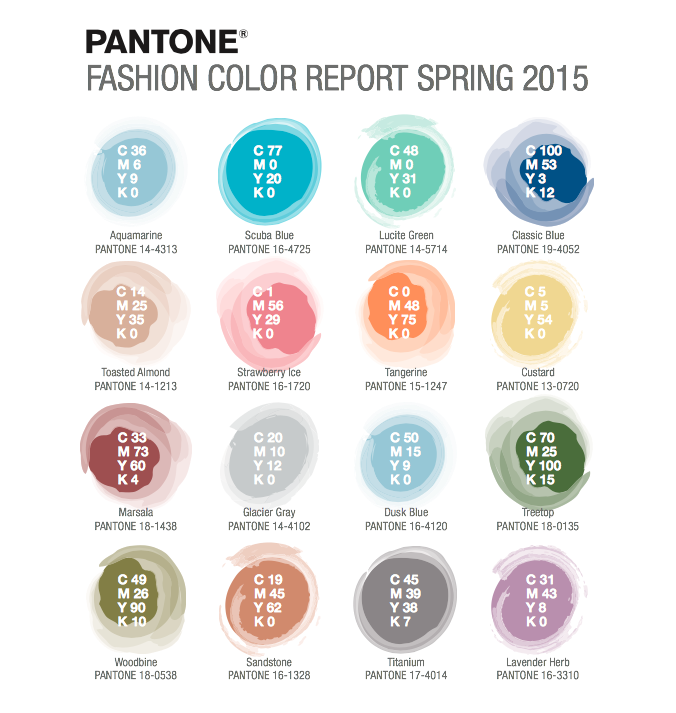 More to see in the blog hop! Don't stop yet! You'll miss out on all the Moon Garden goodness! These pieces were made by Laurie Carpenter. Here's what she had to say about them: "This was my first time doing a kit and although I was very excited, I was also a little overwhelmed! 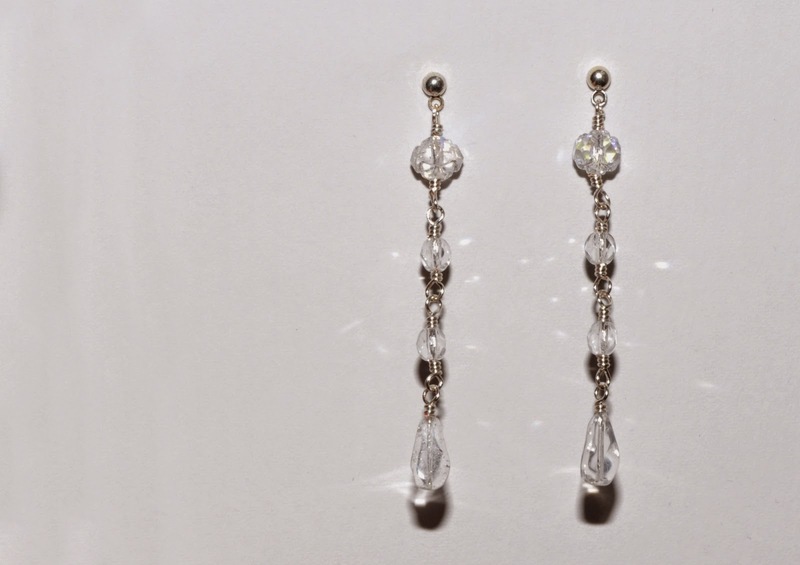 My favorite thing to create (and wear) are dangly earrings. So, that's what I started with! The color palette made it perfect for creating pieces that really seem to glow and I like that they make me feel like I am wearing a literal "moon garden"." "I also made a bracelet that didn't turn out exactly like I planned. My wrists were too small for everything I had envisioned! But I really like the way it ended up. I added a pop of purple and the Hill Tribe silver piece is something I picked up in a bead shop in Sarasota years ago and I had been waiting for the inspiration to strike. Thank you, Andrew, for this opportunity!" Want to see what others created with the same kit? Check out what other participants of the challenge made! 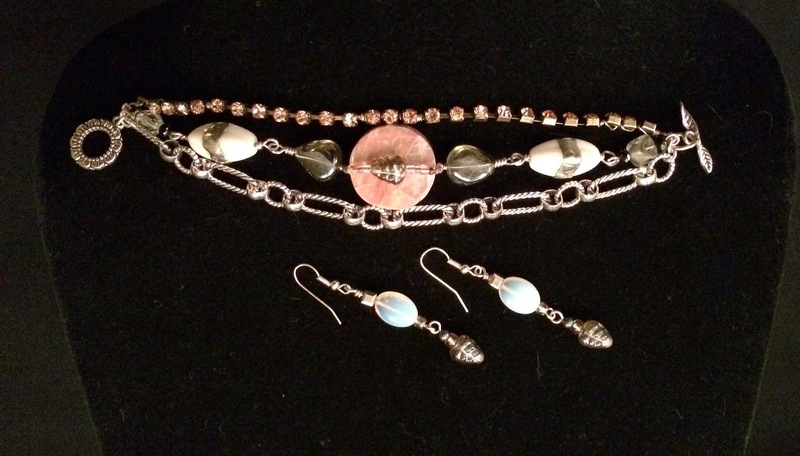 These pieces were made by Geri Colgrove. Here's what she had to say about them: "I've titled this series, Dance in the Moon Garden. 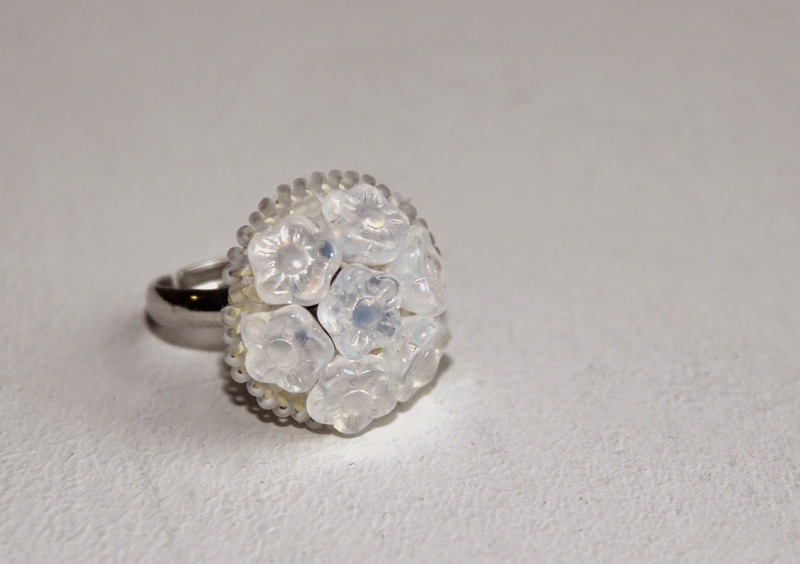 The beautiful mystery focal was cold connected to a decorative metal disk with tabs, a white flower bead, and iridescent beads." 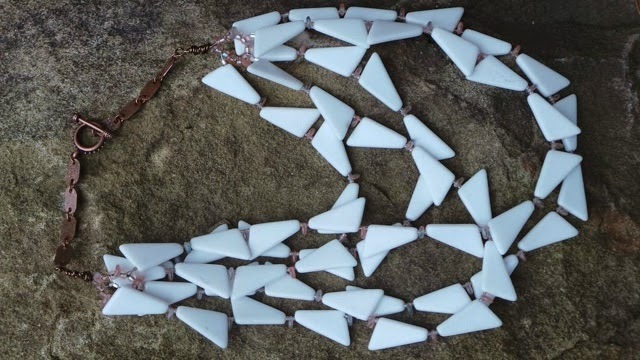 "The large white beads were taped with copper tape and soldered with silver-colored solder for added charm." Here's a close up of the focal. Geri also made matching earrings and a bracelet. 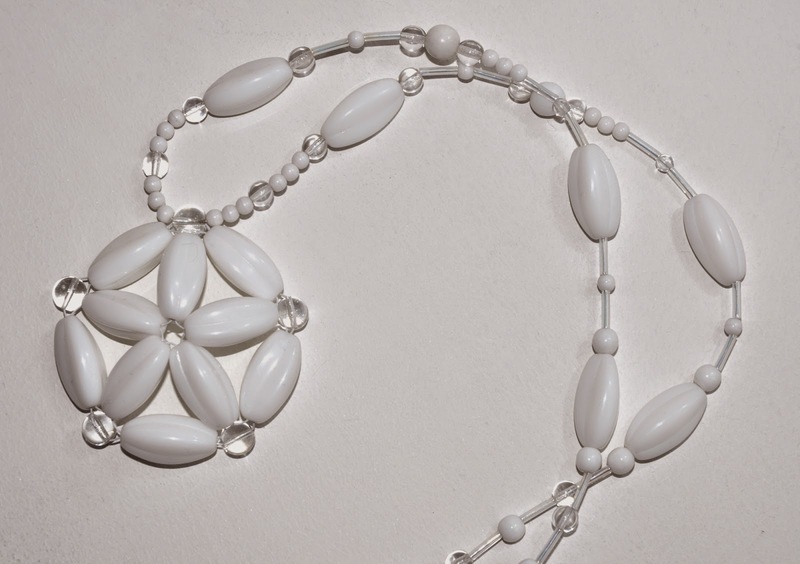 Here's what she had to say about them: "On the bracelet, I used the peach colored shell-like disk as the focal, along with two of the enhanced white beads. On one side I added a brass chain of peach colored rhinestones for sparkle, and on the other a silver chain for balance. The earrings are made with moonstone looking beads and iridescent leaf beads, which is also used on the bracelet. I used a decorative silver toggle. This definitely was a challenge as I do not normally use this color combination. Thank you, Andrew Thornton for this challenge!" Don't stop now! There's more creations to see! 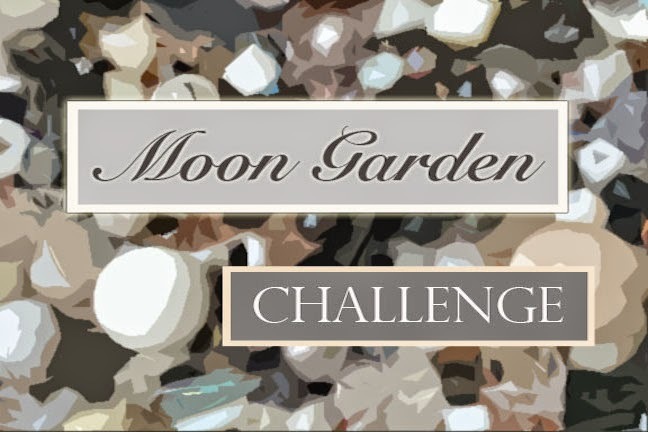 Stroll around the blogosphere and take a gander at all the stellar pieces created for the Moon Garden Challenge! These pieces were made by Crystal Lombardo Farrell. 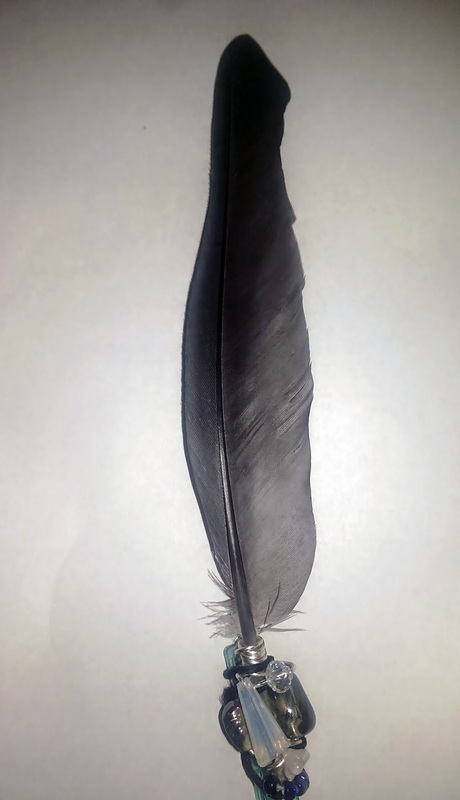 Here's what she had to say about them: "My African Grey, Sebastian, regularly sheds his flight feathers. My brother found this one in great condition, and I was inspired to make something out of it. 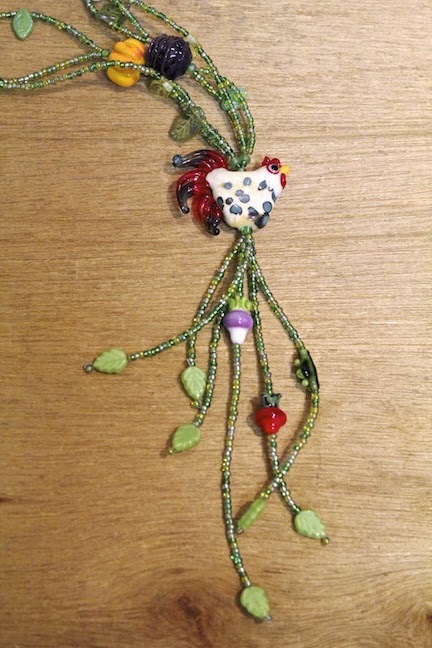 I thought a sort of abstract hatpin with geometric wire and cord and beads might be nice, so that's what I did!" 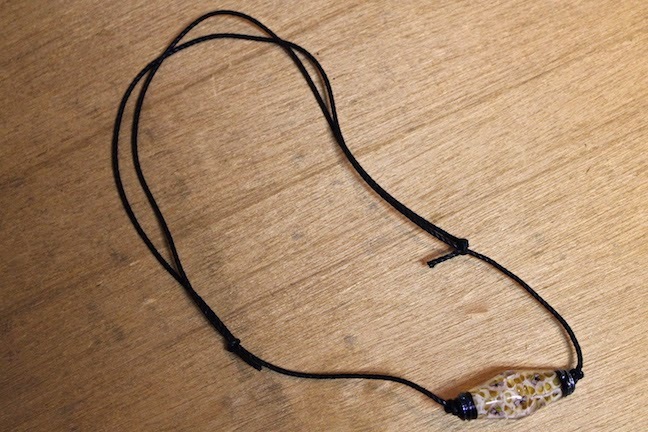 "The second project is a necklace. 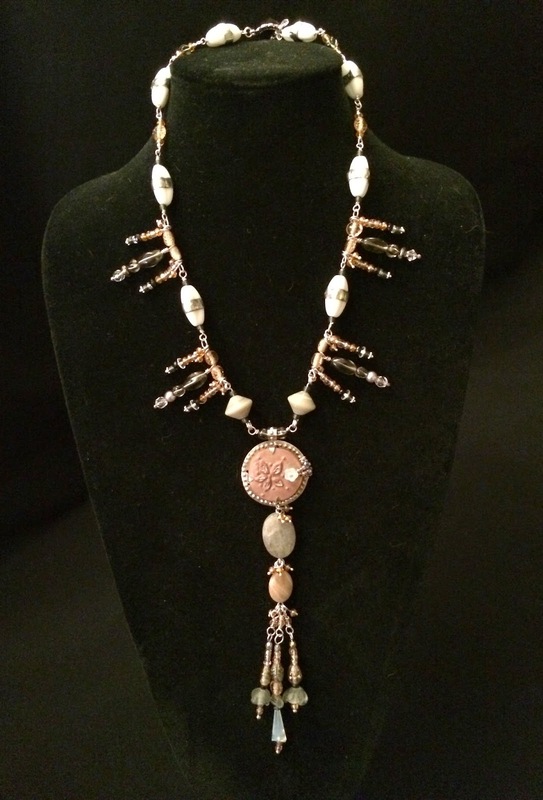 This color scheme felt very Victorian to me, and with Victorian jewelry more is always better! I wanted to highlight how lovely the beads were and pick a pattern that set each one off instead of hiding some. I haven't decided yet whether to connect the three strands with knotwork or more beads, and I didn't end up being able to make the decision in time. I would still like to include what I have done though, and I am excited about finishing it." There's more to see in the Moon Garden Challenge! Swing by all the different participants! It's hard to believe that November is almost over and that Thanksgiving is only a week away. Soon it'll be Christmas, then it'll be a new year! Time is just slipping by. Today is the reveal for the Moon Garden Challenge. It was inspired by the colors found in natural moonstones, a blend of washed out peaches, cool whites, and dove grays with pops of inky black. 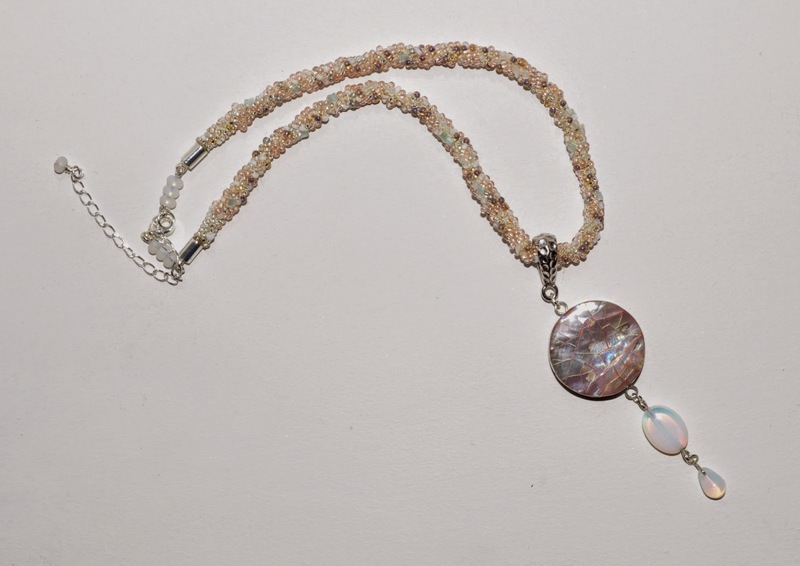 The kit included a mix of vintage Czech glass, shell, labradorite, crystal, opalescent glass, vintage Japanese glass, African glass, waxed linen, antique seed beads and a Luxury Bead Blend. This isn't the piece that I originally made. 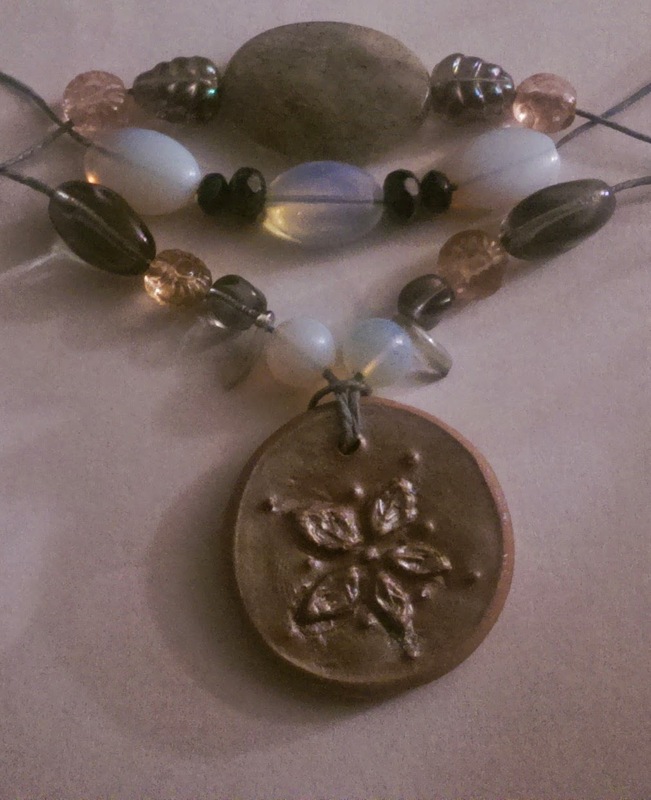 I actually started early and created an embellished chain with wire-wrapped dangles strung up with moonstone chip. It looked quite smart, if I don't say so myself! But unfortunately, I misplaced it and couldn't find it to take a picture of it. So... I made something new. I used flat, square-cut natural moonstones, the faceted labradorite oval from the kit, and a sterling silver flower clasp from Green Girl Studios. The design is simple, but I like it... especially as a backup design. Don't forget to hop along with us and see all the creations created from the Moon Garden Challenge kit. Sometimes things happen and the best laid plans go by the wayside. Today is the Catch Up Reveal for the Inspired by Reading Book Club. Here are a couple of projects that didn't get shared during the original reveals. This piece was made by Terri Greenawalt for September's selection, "Lavinia" by Ursula K. LeGuin. Here's what she had to say about it: "The Lavinia piece featured a large flame work bicone created by Stephanie White of Beads by Design. It was strung on twisted black leather for an account, rustic look." This piece was also made by Terri. She made it for our July selection, "The Immortal Life of Henrietta Lacks" by Rebecca Skloot. Here's what she had to say about it: "The Henrietta Lacks necklace features a lampwork glass rooster by Caroline Hipskind and lampwork glass veggies crafted by Nancy Smith of The Glass Bunny. 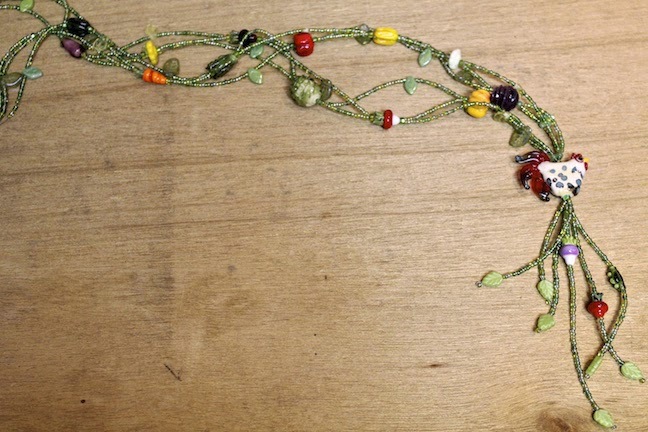 The seed beads rounding out the necklace were a custom mix of various greens by me." Here's a close-up of the focal in Terri's piece. The piece is supposed to represent her childhood on the farm and trip to the gardens later on in life. 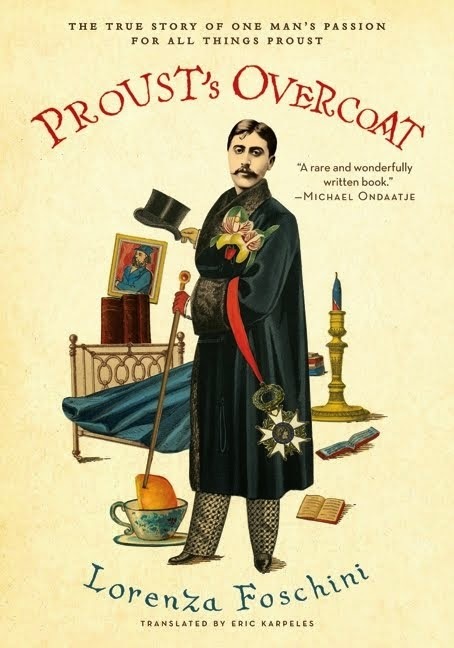 Our November selection is "Proust's Overcoat" by Lorenza Foschini. Because of Thanksgiving, the meet up is scheduled for December 3rd. The blog hop is scheduled for December 4th. I hope you'll join us! This is a short book and a quick read! CLICK HERE for the full book club list. 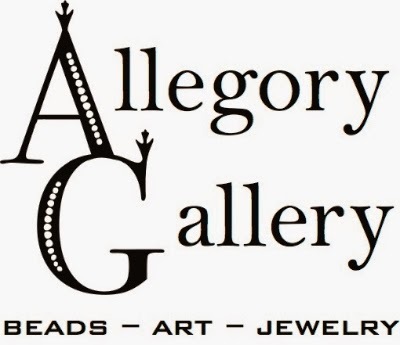 Did you see the latest newsletter update for Allegory Gallery? It's definitely worth a moment or two to check out. We have a lot going on! My favorite part is the note from William. Even though he is an integral part of the business, because I'm behind the counter the most and am very vocal, a lot of people assume it's a solo show. When, in fact, were it not for him, this dream could not be a reality. So it's nice to hear more of his thoughts. I love his reflections on the holiday season and am tempted to rent It's a Wonderful Life. CLICK HERE to take a look at the newsletter. The November selection for the Inspired by Reading Book Club is "Proust's Overcoat" by Lorenza Foschini. Mark your calendars! The in-person meeting at Allegory Gallery is scheduled for Wednesday, December 3rd. 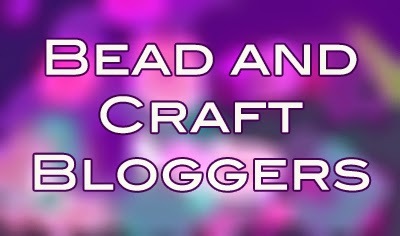 The next blog hop is planned for Thursday, December 4th! It's a short book, so I hope you'll join us in creating pieces inspired by the book! CLICK HERE to visit our Facebook page to keep up with us! Also, join us next week on Wednesday, November 19th for our Catch Up Reveal. This will include projects that we made for different book club selections that weren't previously posted. Should be fun! One of the things about Allegory Gallery that gives me the most pride is that we are able to give emerging artists an opportunity to show their work and encourage them in their creative careers. I remember how difficult it was when I first journeyed forth on this path. One of the biggest obstacles was a sense of validation. Is this art? Was it good? I asked myself these questions. The turning point came when I started showing my work and a dialogue began. That was the transition from just doodling for myself and being an artist: Communicating. So there's a certain special sense of satisfaction when we start the conversation for artists and their work. It's the feeling of finding a precious gem on a walk in the woods. Our current featured artist is named Todd Beisel. Todd is a local from Johnstown and has training from the San Francisco Art Institute. He is just starting out and this is his first solo exhibition! The name of his show is, "The Whispering Woods". When you look at the paintings, it's easy to see them as whimsical and fantastical. They are often times bright, colorful and deal with a magical subject matter, but if you look closer there's a great depth here. Todd uses storybook characters from mythology and fairytales to evoke the rawest of human experience. He plays with symbolism like the Tree of Life and references pop culture creatures like J.R.R. Tolkein's Ents and Entwives or L. Frank Baum's the Forest of Fighting Trees (aka the talking apple trees) in the Wizard of Oz. The Tree of Knowledge of Good and Evil from the Bible is alluded to and so are the hamadryads and dryads, tree spirits from Greek mythology. Working with these familiar elements, he digs deeper. Consumed by fungi, his character is the picture of stoicism in "Confinement". A face emerges from the shadows and twisted lines, almost obscured and hidden in "Solitude". Draped with garlands of flowers with upward composition, resting on the crown of branches backlit by a warm, central sun, the "Empress" embodies strength and regal power. In "Withered", there's a portrait of a kindly willow tree worn by time; the look in the eyes wise and grandmotherly. The fantastical elements of nature enhance the feeling and personalities of his portraits. Looking at his pieces, Pre-Raphaelite images come to mind. More contemporary artists would be Stephanie Pui-Mun Law, who also creates mythic art and works in watercolors. Both artists have a knack for capturing light in their paintings and weaving fluid lines in curling compositions that unfold as you study closer. I hope that if you're in the area, you'll stop in to see the exhibit. If you aren't local, CLICK HERE and you can see the full exhibit online. And if you enjoy the work, I encourage you to adopt a piece for your own collection. I remember what it was like to be a young artist, just starting out. Each sale in those early years was a confirmation that the artists' path was the right path. Each sale was a sign to keep going and I doubt that without that early encouragement and support, I would be where I am today. So, if you like a piece, think about devoting a portion of your home to live with one of Todd's creations. 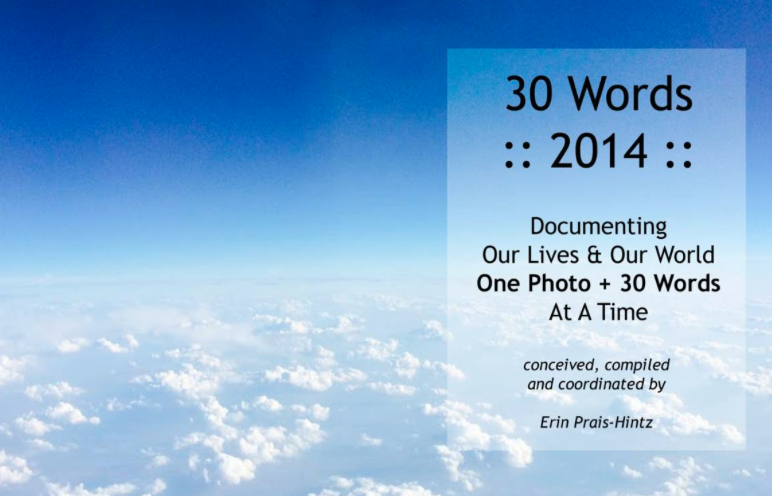 If you follow along with this blog, then you know that I occasionally participate in a project created by Erin Prais-Hintz called, "30 Words Thursday". The concept is simple: Post a picture on Thursday and write 30 words in relation to it. In essence, it's an exercise in brevity. And surprisingly, it's a lot trickier than it sounds... especially for ramblers like me! It's hard to believe that a year has passed since she first started this project. To celebrate the completion, she has created a print on demand book with proceeds going towards the Alzheimer's Association in honor of her mother. I'm honored to have my photos and words featured in her collection. CLICK HERE to find out more about this new digest and CLICK HERE to order your copy. I originally read this when I was in art school. It was from a book, "Letters to a Young Artist". The book deeply influenced me at the time, as it felt like the book was written for me and included grains of wisdom from some of the most influential people in the art world. Even though it has been years since I first read the book, it still contains poignant advice. I thought I would post this, because of the comments I saw on a performance Yoko Ono gave. She did a rendition of Katy Perry's song, "Firework" and some of the comments were particularly cruel. I thought it would be a good time to revisit this little gem and share it with all of you. You could be 18, 30, or 50, you are young to have decided to be an artist at this time in your life. First let me congratulate you on your choice. From here on, you enter the endless magic life of being an artist. The world is your oyster: It will provide you with unlimited material for your art. Look at it again from that point of view. Suddenly the world is a different place, so interesting, so beautiful, and so mysterious. Have fun with it. And share your fun with us. You, as an artist, will unfold the infinite mystery of life and share it with the world. It may just be two people your work will communicate to. Don't be upset. Be upset if you are not happy with your work. Never be upset about how many people have seen it, or how many reviews it has received. Your work will exist and keep influencing the world. Moreover, your work will keep changing the very configuration of our world no matter what kind of attention it gets or doesn't get. So even when you are an unknown artist, be caring of what you make and what you give out. Your work, no matter what, affects the world, and in return, it brings back 10 times what you've given out. If you give out junk, you get back junk. If you give out confusion, you will give yourself confusion. If you give out something beautiful, you will get back 10 times more beauty in your life. That's how it works. You are now like a tree in the park. Your existence is making the city breathe well. So relax and be yourself. Don't try to be anything but yourself. Rely on your instinct and inspiration. Go with it! By the way, many thanks to you for being an artist. I am aware that I will be one of the many, many people who gets the benefit of your decision. I wish you great success. I just wanted to let everyone know that I've pushed back the Reveal date of the Moon Garden Challenge. It's funny because I actually worked on this project so long ago that I blanked out that we were supposed to share our projects tomorrow. So, the new date is Thursday, November 20th. So if you are participating, send me a link to your blog or send me an image with a short description and I'll post it for you. I'm super excited to see what everyone makes! Decoupage has really come a long way with the addition of new tissue papers. Check out this hot pink, cheetah pattern reindeer head. You've heard of sampler quilts and even a candy sampler, how about a Swarovski pearl sampler? 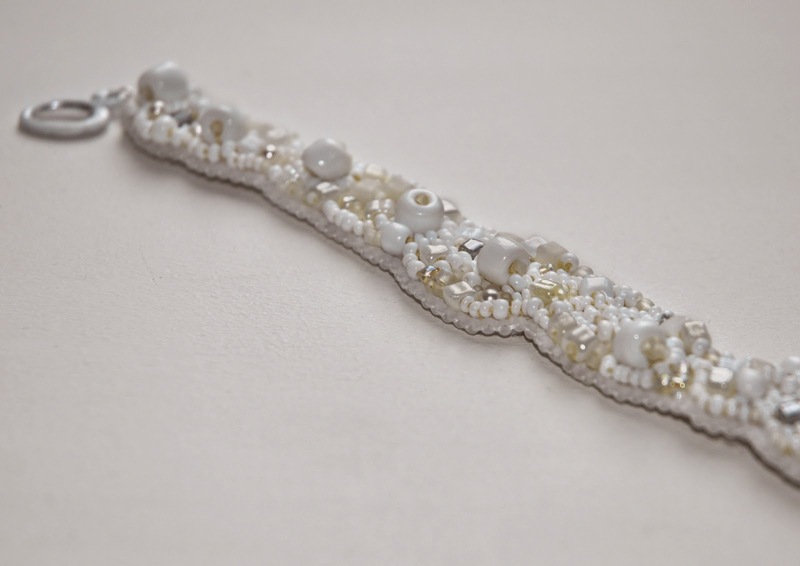 Lisa was so taken with her sampler bead strand, she made it into a bracelet. Pigment inks are the most common media for art stamping, but there are others. Eileen experiments with acrylic paint stamping as she starts designing her Christmas cards. Cyndi made some really fun, new, double-wrapped bracelets using Offray ribbon. Come see how it's done! Cherie plays with some mini canvases. There's anger in the air. In times like these, deeply polarized and pulled apart by politics, I think it's important to remember that there is love everywhere. Sometimes it's easy to see, pink letters spelled out on red-brown bricks. Other times we have to dig deeper. Be kind to each other. Respect one another. Treat others how you would want to be treated. While we might see the world differently and have opposing views, we are all people. We are all people deserving of love and when we recognize this and acknowledge it, we can do more. Be good to each other. When I was a little boy, I had one wish. I wished for my family to be whole again. And then, after many years of wishing that wish and trying to fill that void, it was granted. Things don't always turn out the way you imagine them though. I had these technicolor fantasies of matching ugly sweaters and overly airbrushed family portraits. The reality was different though and try as I might to put things back together, there will always be hairline fractures, a memory of the original break. I want to say that I was a good brother and that I was warm and welcoming. The truth is that I held my breath, waiting for the floor to fall out. When you're used to disappointment, it's hard to expect anything else. I grew into a person that I thought was good, but there's a hardness in my heart. Too much scar tissue. Too many nights wondering and searching the skies for a sign. I feel guilty for not trying harder. I feel guilty for not feeling gratitude for a miracle. I feel guilty for going along with the life I've created in the face of absence. I feel guilty for not feeling more guilty. It has been weighing on my mind... and still, I say, nothing. I say nothing, because nothing is what we're used to. There are years of nothing. Decades of nothing. Almost a quarter of a century and for some, an entire lifetime. I looked out over the pond. The branches of the trees above were reflected in the surface. Branches and leaves in perfect duplication. One white fish with silvery scales swam through the water and it almost looked like it was swimming in the trees. It looked like a lonely creature, out of its element, somewhere it shouldn't belong. I looked at that fish and I saw a little boy, crying under a table... wishing for a brother to come home. Have you had a craft fail? If you have, and could laugh about it, you'll love this new book. Keep up on all the latest updated and more at the Crafty Princess Diaries' Facebook page. Like it, and make sure to click on the drop down notifications menu when you do. Check out the October Monthly Challenge recap of entries. Check out what Andrew and the other participants of the Inspired by Reading Book Club made in response to "The Ocean at the End of the Lane" by Neil Gaiman.